In a demo video for the next installment of Mortal Kombat, series staple Scorpion is moments from being decimated by the fatality of D'Vorah - an insect-like woman joining the roster. In her final move, she summons a swarm of flesh eating bugs. They eat two holes into Scorpion before setting on his head. The flesh disappears quickly - his skin eaten away first, inner flesh and then the muscle closest to the bone. In the end, all that remains is his skull and his jawbone hangs off to the left, like a door on a rusty hinge. Adding insult to fatal injury, Scorpion's skull rolls away and D'Vorah crushes it with the heel of her boot. Creative. Disgusting. And yet, strangely beautiful. Mortal Kombat X continues the franchise's grand tradition of a love affair with gore. Mortal Kombat X and the beauty of gore originally appeared on Joystiq on Wed, 31 Dec 2014 18:00:00 EST. Please see our terms for use of feeds. What are you picking up (or hoping to buy) during Valve's quarterly sales event? Let us know in the comments below. Steam is wrapping up its Holiday discounts with a two-day Encore Sale, which brings back the best deals from the past two weeks. With so many great games to choose from, our pick of the day can only be GameSpot's game of the year, Middle-earth: Shadow of Mordor. Sometimes you just need to unload two submachine guns into some robot Nazis, If that's the particular itch you're looking to scratch, you can't do much better than Wolfenstein: The New Order, especially at $20.49. If you're not quite sure that it's for you, make sure to read GameSpot's review. At $26.79, our PC game of the year Divinity: Original Sin is far from the cheapest game on Steam's Holiday Sale, but it's still more than worth it at that price. As GameSpot's review said, "to play Divinity: Original Sin is to fall in love with role-playing games all over again." Alan Wake is a few years old at this point, but it still looks and plays great. As GameSpot said in its review, the game's creepy atmosphere, fantastic combat, and clever storytelling make Alan Wake's quest thrilling from beginning to end. For $3, it's a must if you haven't played it already, and if you have, it's still worth revisiting on max settings on the PC in anticipation of Remedy's Quantum Break. Brothers is clever puzzle game with a huge heart. It's a short, beautiful experience, and an absolute steal at $1.49. Once you'll play it you'll understand why we're excited for developer Hazelight's next game. A perfect transition from TV show to game. While not every South Park game has been a hit, this one perfectly encapsulates the snarky humor of Matt Stone and Trey Parker. Read our South Park review and check it out on Steam here. Simplistic graphics doesn't mean simple game. Kind of like a 2D Minecraft, Terraria is a game where your imagination can run wild. And at $2, you can afford a four-pack to get your friends in on the action with you. Read our review and check out the game on Steam. The continuation of the BioShock series, and likely the final one from Ken Levine, Infinite was a divisive title among fans. But either way, it's a game worth checking out, especially for $7.50. Read our GameSpot review and check out the game on Steam here. Sure, everyone might be more focused on getting Grand Theft Auto V on PC, but that doesn't mean that $5 for GTAIV isn't a steal. And with a crazy modding community that's been supporting the game for years, there's plenty to explore outside the main game as well. Read our review of the game and check it out on Steam here. There are some bigger and newer games on today's list, but with an 80 percent discount that brings it down to $4, you should take the opportunity to catch up with Bulletstorm, a score-driven first-person shooter with some really great, original weapons. Metro 2033 was released four years ago, but with the Redux treatment, it's still one of the best-looking first-person shooters on PC. If you didn't play it back then, you owe it to yourself to pick up the discounted version. Read GameSpot's Metro 2033 Redux review and check it out on Steam here. At 90% off, there's no reason not to buy developer The Behemoth's colorful beat-em-up. It makes a good gift as well; after all, the game is a lot more fun with friends. Read our Castle Crashers review and check it out on Steam here. The follow-up to the crazy-hard Demon's Souls and the crazy-hard Dark Souls is... still crazy-hard. The game might not be to everyone's tastes, but it's a series that you have to respect for sticking to its punishing formula. Read our Dark Souls 2 review and check it out on Steam. And an additional six flash games (note that the deals below didn't expire 24 hours after posting. Xbox wraps up its daily deals leading into the new year today, featuring add-ons like the Dead Rising 3 season pass and Red Dead Redemption's super excellent Undead Nightmare Collection. There's also BioShock Infinite's Burial at Sea's two episodes at about $5 apiece. There's also been a slew of sales on Xbox One and Xbox 360 games this week. The deep discounts for Xbox One owners include the worthwhile Alien: Isolation, along with Telltale Games goodies like Tales from the Borderlands and Game of Thrones at $2.50 apiece. Worth a browse if you're planning on staying in tonight. 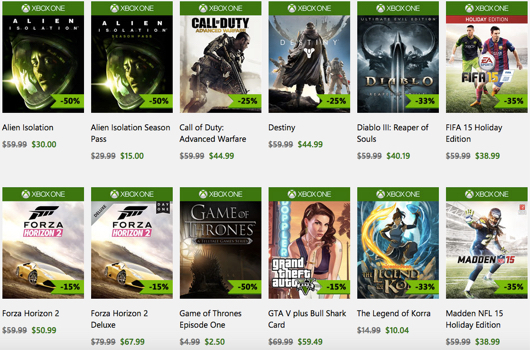 Xbox countdown sale wraps today originally appeared on Joystiq on Wed, 31 Dec 2014 12:00:00 EST. Please see our terms for use of feeds. You've seen our official picks for the best games of 2014. You may have also seen some of our editor's already outline their top five games of the last 12 months. But if you want to know more about what individual staff members at GameSpot thought were the highlights for the year, then you've come to the right place. Below (in no particular order) we've collated more of our editor and video producer picks for the best games of the year. What Year Was The Best for Games? During the last five days, we've been running a series of features looking at some of the best years in the history of video games. Our selected years--1993, 1996, 1998, 2004, and 2007--were chosen not only for the amount of outstanding games that were released within their calendar confines, but how important those games have subsequently become. Now it's your chance to tell us your opinion. Which of those five years do you think is the best? Or have we completely gotten it wrong? If so, sound off in the comments below for what you think is the more deserving year. "Back in '93, arcades were still a pretty big deal, Jurassic Park confirmed that dinosaurs were real, and some of the most memorable franchises in video gaming were born. Console makers were racing to try and bring the arcade experience home with machines like the 3DO, the Atari Jaguar, and the Amiga CD32, but in the end, it was the experiences that mattered most. It's a lesson that still plays out today: it's not about what machine can push out the most pixels, it's about how good the games are." "In 1996, the industry landscape was forever altered with a handful of game-changing new franchises. It was a golden year for strong leading characters and equally strong new gameplay ideas, both from Japanese and Western studios. Icons that are now household names—including Lara Croft and Crash Bandicoot--were born in 1996. It was a good year to be a Mario fan as well, with still-beloved favorites from two branches of the franchise making their debut. Not to mention this was the year the world got Pokémon, a series that would reach dizzying heights of popularity nearly two decades later." "1998 was a year of firsts. The first narrative-driven shooter. The first three-dimensional Legend of Zelda game. The first modern stealth simulator. The first Japanese role-playing game that would drive us to catch them all. The first game to emulate cinematic techniques and direction. And the first RPG from a developer that has now become the genre's leader." "The early years of video gaming were defined by invention; 2004, by contrast, was about redefinition and refinement. Few of the year's standouts burst with wholly new ideas or introduced new genres. Instead, they set standards by which similar games would be judged in the decade to follow, and in the process, established themselves as masterpieces in their own right. You might call 2004 the year of the sequel, given the many high-profile follow-ups that iterated on the games that preceded them, but the successors that defined the year were hardly retreads. Not to mention, of course, the jewels that launched entire series' of their own, yet still shine even within the shadow of the games that followed." "2007 defined the seventh generation of consoles. This was the year that developers finally got to grips with the powerful new hardware of the PlayStation 3 and Xbox 360, and delivered games that were bigger, brasher, and more spectacular than ever before. Enduring franchises like Assassin's Creed, The Witcher, and Uncharted all made their debut in 2007, while Nintendo Wii owners were treated to one of the greatest 3D platformers ever made in the form of the sublime Super Mario Galaxy." Vote now in the poll below. Voting closes at 8am PT on January 5, 2015, and we'll tell you the results shortly after. Microsoft will phase out sales for the original Kinect for Windows in 2015. The decision follows the arrival of the sensor's second version and PC adapter in October, as well as the latest hardware's SDK being made freely available. The company noted in an announcement blog that companies reliant on the original motion sensor should contact Microsoft soon to fill orders for the older hardware, though "no more original sensors will be manufactured after the current stock sells out." Version 2 of Kinect for Windows is essentially the same tech paired with the Xbox One when Microsoft's latest home console launched in November 2013, save for two changes: Microsoft pulled the Xbox logo from the camera and added a separate hub and power supply to operate. Microsoft's PC adapter for the Xbox One Kinect links the new camera to Windows 8 machines using USB 3.0 for $50. The original Kinect for Windows hardware launched in February 2012. Original Kinect for Windows being phased out next year originally appeared on Joystiq on Wed, 31 Dec 2014 10:30:00 EST. Please see our terms for use of feeds. The only way to currently play the Halo 5: Guardians multiplayer beta is to be a Xbox One Preview member or to own a copy of Halo: The Master Chief Collection. But soon there will be another way to play the game ahead of its release next year. Best Buy on Wednesday announced that this weekend, 50+ stores across the US will have the game available for anyone to play from 3-7 PM local time. Head to Best Buy's website here to find a participating store. All Best Buy stores--including those that don't offer the Halo 5 multiplayer demo, will give away free Halo 5 posters to anyone who preorders the game now through January 3. On top of that, shoppers can get a Best Buy-exclusive artbook when they pick up the game next fall. In other Halo 5 news, Microsoft and 343 Industries recently announced $100 and $250 collector's editions of the game. For more on Halo 5, check out GameSpot's previous coverage. Electronic Arts' online store Origin has not suffered a breach of its account database, the Battlefield and Mass Effect publisher said this week after some users reported unauthorized purchases on their accounts. "We found no indication at this point of a breach of our Origin account database," an EA representative told PCGamer. "Privacy and security of user account information are of the utmost importance to us. We encourage our players to use Origin user ID and passwords that are unique to their account, and to report any activity they feel may be unauthorized to EA customer support at help.ea.com." Writing on Reddit earlier this week, some users reported suspicious behavior on their Origin accounts, including game purchases that they never made. EA confirmed to PCGamer on Tuesday that it was investigating the matter, though it's unclear how widespread the issues were. It appears EA's customer support department is working with affected users to remedy fraudulent account activity. PCGamer also points out that Origin now has a two-step authorization system (similar to Steam's) that alerts you when your account is access on a new device. In other Origin news, the store is holding a year-end sale that offers deep discounts on a huge number of games. The deals end January 6. Encountering bugs with the recently released PC version of Metal Gear Solid V: Ground Zeroes? If you are, you're probably happy to learn Kojima Productions has released a new patch that aims to address three major issues currently affecting the game. These are listed out below. You can download the update by installing a new version of Ground Zeroes that's available to people who opt-in to the Steam Client beta. You can do this by right-clicking on Ground Zeroes in your Steam Library, selecting Properties, then the tab for Beta. Kojima Productions says in a post on the Ground Zeroes Steam page that it will continue to monitor the game's discussion forums to ensure that the game's bugs have been resolved. Under some conditions, there was a "Low Memory" error a few minutes after launching the game. This issue has been fixed. When some USB devices were connected the game didn't launch. This issue has been fixed.